A bracket clock tends to be a larger antique clock, generally cased in wood, although the name is a slight misnomer. In the seventeenth and eighteenth centuries, most floors where of an inconsistent level and stability. Therefore, a piece of furniture placed on a floor would be unsuitable to have a clock placed on it as it would tend to rock slightly or lean in one direction. 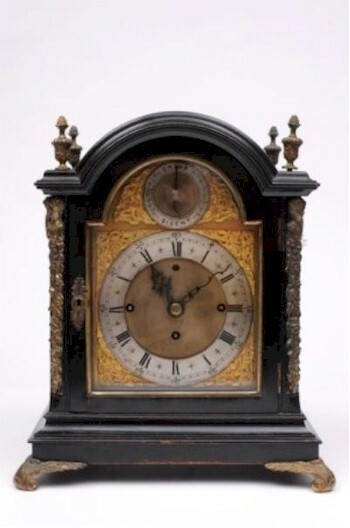 An early Victorian ebonised quarter-chiming bracket clock (FS18/768), which was sold for £1,600 in the antique clocks auction within the April 2013 Fine Sale. Mantel pieces were no good to take these larger, bulkier proportioned clocks, and so many employed a wall bracket to sit on, although by no means all. The term bracket clock was employed to differentiate this larger clock with the slimmer mantel clock and has stuck, even though by the middle of the 1700s few clocks of this nature actually sat on a bracket, but tended to be sat on sideboards or tables. Indeed, another term for this style of antique clock is table clock. All the top makers from the Golden Age of English Clockmaking made bracket clocks: Joseph Knibb, John Knibb, Edward East, Ahasuerus Fromanteel, Johannes Fromanteel, John Hiderson, Henry Jones, William Clement and the Father of English Clockmaking, Thomas Tompion. 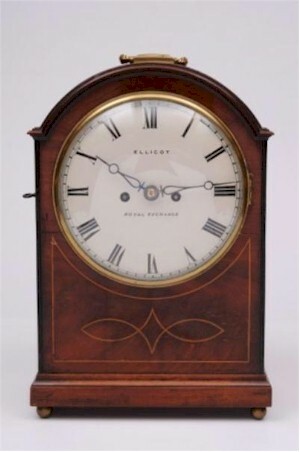 A mahogany bracket clock with an eight-day duration by Ellicot of Royal Exchange in London (FS18/769) fetched £880 in an antique clock auction. At this period most of these makers were experimenting with various escapments with the verge escapement making way for the more accurate anchor escapement in the mid to late 18th century. As would be expected, bracket clocks signed by these illustrious makers will command prices often in six figures. The anchor escapement was the most widely used in bracket clocks by the time the 19th century clockmakers were undertaking their work, a period when ebonised and walnut cases had given way to mahogany, although oak was still used as it had been from the beginning of domestic clockmaking. The bracket clock movement from this later period tended to be of a more standard design, with a double fusee striking on a bell and rack strikework. By now, a number of clockmakers, such as Handley & Moore and Thwaites and Reed, were making the clock movements for their well-known colleagues such as John Barwise, due to the demands being made on these top clockmakers, who didn't have the workshops to keep up with demand. For instance, John Taylor of London, a clock maker of some repute, is known to have made complete clocks to be retailed by other clockmakers, with just the engraved name to the dial and backplate being different. These clocks from the late-Georgian, Regency period are some of the best proportioned and classically formed and, therefore, always sell well in salerooms. In the bracket clock category can also be seen skeleton clocks of the Victorian period, often by the top skeleton clock makers such as John Smith of Clerkenwell and Evans of Handsworth. Some well-made bracket clocks from the later Victorian era were made in Germany, most notably by Winterhalter & Hoffmeier whose movements can be identified by the stamped initials on the backplate W&H Sch. These movements are comparable to those made in England at the time, especially the better quality produced by W&H, which employed the English style fusee and where often fitted with musical movements chiming on eight bells or gongs reminiscent of those London clocks from the century earlier.